Oh how I love my cast iron! Let me count the ways. When you pick up these pieces, you immediately get the feeling that this cookware will not only last your lifetime, but your children's and grandchildren's as well. 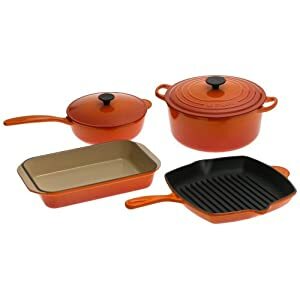 This is top of the line cast iron and know that when you've purchased this, you've bought the best. Available in a rainbow of colors, you're sure to find one that will excite you when you open your cabinet doors. From soups and stews to casseroles to searing that ribeye, you'll be looking for an excuse to cook with this versatile set.